The Green Party of Canada prides itself on doing politics differently. Often, that’s what sets us apart from the other old-line political parties, and our progressive approach to politics is usually worn as a badge of honour. But sometimes it can get us into hot water. Doing politics differently, in my opinion, is a worthy goal for the Party to continue to pursue – but it must always keep in mind that, differently or not, the Party remains engaged in politics. The recent revelation that Green Party of Canada Deputy Leader, and nominated candidate for the Greens in the yet-to-be-called by-election in Bourassa, Georges Laraque, is facing fraud charges, will not sit well with Canadians. Although Laraque has yet to face these charges in court (the first appearance is apparently scheduled for November 19th), the charges will certainly create questions in the minds of Canadians. Often, when politicians are faced with having to answer charges before the courts, they step aside from the daily duties and focus instead on mounting a defence and clearing their names. Stepping aside is also good for the Party, as the question mark of serious charges can only have negative outcomes for the other good work which the Party is trying to do. That’s everything from policy formulation to fundraising. Yet, the Green Party seems keen on doing politics differently with Georges Laraque. Not only has George not stepped aside from his role of Deputy Leader*, but the Party and he have worked together to build a campaign machine from scratch in the Montreal riding of Bourassa, in anticipation of an upcoming by-election call. Instead of quietly dealing with this difficult personal matter, Laraque and the Party have instead ramped up efforts to put Laraque front and centre before Canadians. Based on Laraque’s interview with a French-language sports network, RDS, as reported by the Canadian Press (“Ex-NHLer Georges Laraque facing fraud charges”, October 17 2013), Laraque admitted to being charged by the director of criminal and penal prosecutions, after an investigation by Longueuil municipal police services. Other media have reported that Laraque was informed of charges being laid only recently. If this really is the case, if the Party has been aware that Laraque could be facing charges and will be required to appear in court to answer these charges, and if they have taken the steps to review his defence and assess the quality of witnesses which may appear in court to help Laraque answer these charges, it suggests that the Party has been very engaged with this matter. If that’s the case, I suspect that the Party is very confident that Laraque will successfully answer these charges in court, else they would not be working with him so closely in Bourassa, building his election team. Indeed, if the Party didn’t feel confident, I suspect that someone might have suggested to Laraque that he might wish to step down as Deputy Leader, and put gaining a seat for the Greens in the House of Commons on hold for now. If Laraque’s statement about the Party’s involvement is accurate, the Party must be very convinced that the allegations are without merit. Of course, Quebec prosecutors and the Longueuil police apparently have a different take on the subject – it’s inconceivable that charges would have been laid after an investigation if prosecutors didn’t think that the outcome would be positive, from their point of view. Nevertheless, prosecutors have certainly lost cases before, and the matter is before the courts to decide now. Based on what Laraque claims to be the Party’s analysis of his case, and the Party’s continued expression of confidence in Laraque succeeding to answer these charges, I suspect that the courts will favour Laraque. Indeed, I expect that these charges have come as a bit of a surprise to Laraque and to the Green Party, based on their perception of the police investigation and past allegations. However, being convinced of Laraque’s ability to successfully answer these charges is one thing. Continuing to promote Laraque on behalf of the Party while these serious charges hang over him is quite another. Canadians are growing increasingly tired with the perception that politicians are engaging in criminal activity, seemingly with reckless abandon. That’s not to suggest that Laraque has engaged in criminal activity, but the perception that he might have is now front and centre, since this revelation that fraud charges have been laid, and he must answer them in a court of law. In short, if the Party didn’t think that the earlier allegations could lead to charges, and that being charged by Quebec prosecutors would affect voters in Bourassa, and more broadly, the opinion of Canadians with regards to the Green Party across Canada, just what was the Party thinking? Look, I’m a huge fan of Georges Laraque. I’ve admired him for a long while now, since his days on-ice with the Edmonton Oilers. But it’s not just because Laraque was one of my hockey heroes that I’ve come to admire the man. His work with charities and causes, his boundless enthusiasm, his personal challenges which led to his success – all of these are reasons why I’ve admired George Laraque off the ice even more than I did when he played for the Oilers and Coyotes. When Laraque joined the Green Party, I was extremely happy. When he was named Deputy Leader, I was a little apprehensive, but enthusiastic. Laraque isn’t exactly a political personality, but I firmly believe that politics would benefit from having more non-political people involved, and Georges Laraque certainly fits that bill. But these charges are very problematic. And not just for Georges Laraque. They're also problematic for the Green Party. It would seem that the thing to do would be for Laraque to step aside as Deputy Leader, and certainly to suspend his campaign in Bourassa. But this whole circumstance, apparently, isn’t just coming to light to the Party now – based on what Laraque has said, it seems that the Party has likely known about the seriousness of this situation for some time**. Indeed, the police investigation has been on-going for a while, with a very public search of Laraque's home earlier this year having been reported in the mainstream media. Recall that Laraque indicated that he had received reassurances from the Party that even if he had to go to court, the Party would see him through it. Those reassurances likely were given before charges were laid and any court date was set. I’m just speculating here, but perhaps it was the announcement of the November 19th court date (which could be right in the midst of an official by-election campaign) which prompted the revelation of charges being laid in a media-friendly setting (they really like Laraque on RDS). I certainly appreciate that my Party has offered Laraque its support in facing these charges – and not just support, it’s clear and apparently unconditional vote of confidence in Georges Laraque – but I can’t help but wonder what sort of political risk assessment might have been undertaken by the Party before committing its resources to building a campaign around Laraque in Bourassa. Did the assessment consider the possibility that charges might be laid stemming from allegations and a police investigation, and that the candidate might have to appear in court in the midst of an election campaign? If this were any other political party, I think it’s fair to say that knowing one of its high-profile candidates could be facing fraud charges which will have to be answered in court – there’s really no way that the Party would have ever signed off on mounting a campaign. Now, maybe that says a lot more about how the old-line parties engage in politics than how we Greens do. Morally, is it right to abandon a man if you believe in him, just because he has to answer what appear to be spurious charges in court? Should an organization not continue to invest in an individual whom they believe in? Doesn’t the mantra “innocent until proven guilty” mean something, especially in today’s day and age? Clearly, the Green Party thinks so. And for that I have nothing but the utmost respect – in fact, I think that I have even more respect for the good people in my Party who are making decisions. I mean, Georges Laraque is a good guy – he deserves our backing. Laraque hasn’t yet had the opportunity to defend himself in court – he is innocent. Why not support him, why not endorse him? Unfortunately, Canadian’s perceptions of Georege Laraque, and by close affiliation, their perception of the Green Party, are going to be negatively impacted by the revelation of charges. While it may be the right thing for the Party to do to stand firmly behind Laraque, it is also the right thing for Laraque to step aside until these charges are addressed. At the end of the day, the Green Party is a political party, and Canadians have little faith in politicians, no matter which colour of political stripe they wear. These charges are damaging to the Party – and certainly the Party’s decisions to continue to back Laraque are only going to lead to more questions in the minds of voters. Politically, the Party was going to take a hit with the news of charges against Laraque anyway, given that he has been our Deputy Leader since the summer of 2010. But had Laraque quietly stepped aside as Deputy before news of these charges became public, the Party would have minimized its exposure. I strongly suspect that, if this were any other political party, exactly that scenario would have played itself out. Instead, the Green Party chose to double-down on Laraque, because the Party knew it was backing a good man. Politics, quite likely, didn’t come into play in that decision. And from the fall out which the Party can expect to have to answer for, it’s pretty evident to me that political considerations appear to have been absent. For many in my Party, our continued support of Laraque as Deputy Leader and nominated candidate in Bourassa in the face of this adversity will be scored as a victory. A victory for doing the right thing over doing what’s politically expedient. I’m often one to trumpet the Green Party’s ability to seize the moral high ground over political opportunism – but in this case, seizing the high ground is, I believe, going to have been far too costly for the Party. And opposite the high ground, the terrain isn't just occupied by political expediency - there are some very sensible reasons why Laraque should step aside. With matters now in the hands of the courts, the "what if" games have to start. What if Laraque is found guilty? What if he's asked to serve time? Voters generally like some certainty that their elected representatives are going to be able to represent them in parliament. The possibility of a conviction, no matter how remote, would likely prevent Laraque from ably representing the citizens of Bourassa. With this uncertainty in mind, today, I just can’t conceive of any scenario in which Laraque now emerges as the next MP for Bourassa. Indeed, I find it difficult to believe that Laraque’s name will even appear on the ballot – the political fall-out from this revelation is going to be too great to save his hopes of representing Bourassa in parliament. While we can't turn back the clock, stepping aside would not have been only motivated by political opportunism. It may have saved Georges Laraque a significant degree of grief over the public mud-raking for which he will now experience. Indeed, for the good of the Party, the option to step aside ought to have been explored, and if not by Party officials, certainly by Laraque himself. Yes, I know, Laraque isn’t your typical politician, and as such, his political instincts might not be as finely honed as they might otherwise be (although I suspect that they are growing by leaps and bounds lately). As a fourth place political party, the Green Party’s reality is obviously different from the old-line parties. I believe that we can afford to manage a situation like the one emerging today in a different way from the other parties – but it does need to be managed: carefully and aggressively. Even with careful management, though, the fact is that the Party has always found it difficult to be heard by the national media. When it’s just a matter of getting a message out, our Party has to struggle. For this situation, it’s not a simple matter of getting a message out – it’s a matter of trying to explain our unique and unexpected rationale that supporting Laraque remains the right thing to do because he is a good man - the best man to represent the riding of Bourassa. Knowing that the Party has these significant communications issues to overcome, I can’t help but wonder whether the path that the Party has put itself on regarding Laraque is the best one. Of course, it may yet change - there may be little choice. On the one hand, I understand – the decision to support Laraque was an easy one, because Laraque is a good person, and the right person for the job of MP of Bourassa. On the other hand, the political realities of making the easy and morally right decision are extremely problematic. If managed well, they may yet prove to be a positive for our Party. But these matters are, I believe, too big for our Party to manage – indeed, they would be extremely problematic for any Party. I believe that for the good of the Party, Georges Laraque should step aside until these charges are dealt with before the courts. This is not to suggest that the Party’s decision to back Georges was wrong or inappropriate, because I sincerely believe that there exists a moral case for doing so. But morality and politics are often a difficult combination (even though they ought not to be), even for the Green Party, which prides itself on advocating for right in the face of expediency. On this matter, however, I think that the cost of doing right may ultimately be too great a price for the Party to pay. Paying this cost may severely hamper our efforts to do right elsewhere in the future. I understand that there are those who believe that right should be done whenever and wherever, and that an organization like the Green Party should not pick and choose – but the reality is that there are often numerous, competing right ways of going about things. Continuing to offer Georges Laraque our support and confidence is certainly something which the Party could have done outside of building a by-election campaign for him in Bourassa. One way of looking at it, the right thing to do might now be for the Party to suggest to Georges that perhaps now isn’t the best time for a run for parliament – that his chances for success might, in fact, be better if he waited until 2015. Georges, please consider standing aside for now. The Party will continue to support you. When you have addressed these charges with success, any doubt that Canadians might have had about your integrity will be blown away. You will emerge stronger from the experience, and better able to represent constituents in whatever riding you decide to run in. I know that your dream of representing the good people of Bourassa may be shattered, but it need only be a temporary setback. The Green Party is not going to abandon you. You are a man of integrity, vision and substance. No one can take that away from you; nor can stepping aside. *UPDATE (Sunday October 20/13). 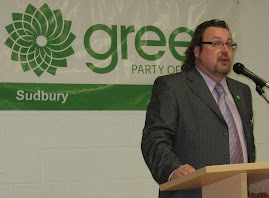 Since publication of this blogpost, Georges Laraque announced on October 17th that he will step down as Deputy Leader of the Green Party of Canada temporarily, to face charges, and step aside as candidate in the Bourassa riding, leaving the door open to the local Electoral District Association to nominate another candidate there, should they decide to do so. The Green Party of Canada and Elizabeth May continue to offer their very public support for Laraque, and have suggested that he can return as Deputy Leader (and potentially as candidate in Bourassa) when he clears his name. For me, the very public support lent to Mr. Laraque during this difficult time suggests that the Party remains engaged in doing politics differently. For May and the Greens, this is the right thing to do, I believe, although there remains an element of risk. But Laraque, who is a good man, should not be abandoned as he attempts to clear his name in this dispute between former business associates. **UPDATE (Sunday October 20/13). Apparently not. In a media conference on Friday, October 18th, Elizabeth May indicated that the Party was extremely surprised that a dispute between two business partners have ended up with charges against Laraque. Laraque indicated that he expected that the matter might end up in civil court, but it really does look like the criminal charges caught Laraque and the Party completely off-guard, as it did many of us following the case through the media. So although it does appear that the Party was knowledgeable about the situation, the severity of the situation (laying of charges) appears never to have been on anyone's radar. ***UPDATE (Sunday October 20/13). Just FYI, at the time of writing, I had no idea this was in the works. But I'm very happy to see it.